Synopsis: In his international blockbusters The Da Vinci Code, Angels & Demons, and The Lost Symbol, Dan Brown masterfully fused history, art, codes, and symbols. In this riveting new thriller, Brown returns to his element and has crafted his highest-stakes novel to date. I’m a massive of Dan Brown and his Robert Langdon books. The Da Vinci Code basically got me to read and these books have since been completely slaughtered by me. 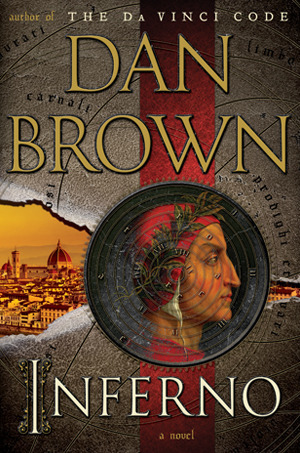 Dan Brown is so great in creating such an amazing story around a painting, a statue, or another piece of art. This book was centered around Dante’s Inferno. Because of Dan Brown I’ve got so many places I want to visit and art I want to see and I need to read and research Dante and his works. I managed to get a hand on an illustrated copy. I got an illustrated copy of The Lost Symbol for my birthday years ago, and I believe it is since the best experience when reading a Dan Brown book. The pictures of the art and buildings and other things talked about in the story help so much with understanding what I’m reading. I’m interested in art, but don’t know that much about it. So being able to see it in the pictures and knowing what a certain place or painting looks like helps a lot with the story. Inferno had a lot of gorgeous pictures in it. The story was great. It was all centered around Dante, which I believe was a great choice. Dante is someone everyone knows about, even if you don’t know much about art or books or anything related to him. After reading this book, I feel like I already have a headstart in my future reading of Dante’s works. As always, it was full of interesting history, art and places to learn about. And of course lot of information about Inferno was given throughout the story. The characters were interesting, with the usual Robert Langdon who we all know now after four books. Mister Zobrist, our villain, was someone we didn’t get to know a lot about. He stayed very mysterious, but had a clear message he wanted to bring out. A message that is also a very current topic. Sienna was a character who didn’t add a lot for me. She was the sidekick we see in every Robert Langdon book. She is crazy smart, but I didn’t see it back in the story a lot. It would have been nice to see her intelligence some more. Was this book better than the other books in the series? I don’t think it was. For me the best book in this series is a tie between Angels and Demons and The Da Vinci Code, and second is The Lost Symbol. I loved reading this book, but the first three wowed me more. Sometimes it felt like this book was stuck in the same place for too long and I noticed it made me skim the pages a bit. I gave this book 5/5 stars. Let me know what you think in the comments. Happy reading!